The minarets of this mosque have the remarkable feature that if one of the minarets is shaken then within few seconds other also begins to shake. One explanation for this phenomena is that the vibrations at the base of tower gets amplified and are transmitted through air tunnels between the two towers resulting in shaking of other tower. Surprisingly, no tremble is felt in the connecting passageway between the two minarets. Each minaret is about 21 metres high and has three stories which have delicately carved stone balconies. The mosque and the minarets were built in 1461 but reason for this design is uncertain. It is believed that such design was adopted to avoid damages during earthquakes. 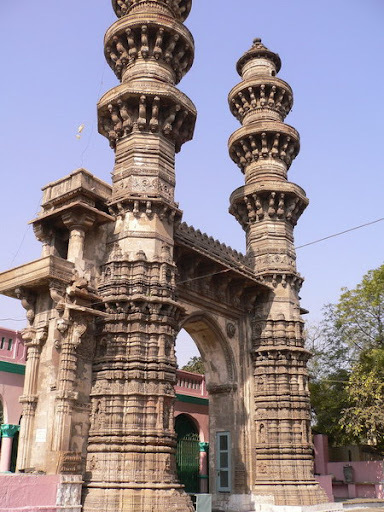 Another mosque in the town known as Raj Bibi Mosque also had a pair of shaking minarets. Reportedly the Britishers, who were ruling India that time, dismantled one minaret in order to study the secret of its construction and the mystery behind the swinging effect. There is another such tower Monar-e-Jonban (meaning Shaking Minaret) in Isfahan, Iran but it is not as remarkable as this one in Ahmedabad. Credits: Special thanks to Laat Saheb for bringing this to my knowledge.